Thendara Satisfaction, also known as Jagger, returned home to Belgium from the Crufts Dog Show Thursday, March 5. By Friday, Jagger was dead. LONDON (AP) -- The co-owners of an Irish setter feared poisoned at Britain's leading dog show are devastated by his death - but they don't believe that one of the other competitors is responsible. The vet "found cubes of meat, some sort of beef, like steak, and they had been sewn up with poison inside," one of the owners, Jeremy Bott, told the BBC. "She thinks there were possibly two or three different types of poison," one of which was a slug killer. Police in both Belgium and Britain are aware of the incident, but authorities said they have not been asked to investigate. The Kennel Club, which organizes Crufts, is awaiting a toxicology report on the dog's death. 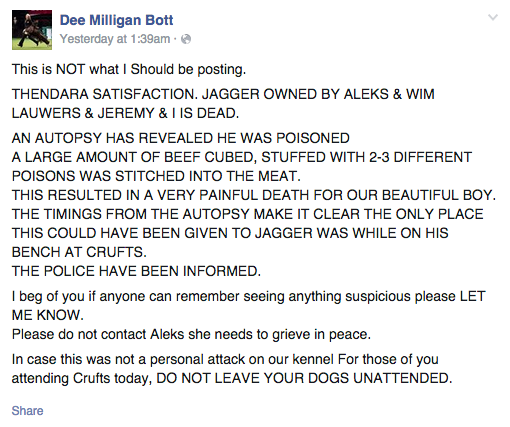 Bott said he doesn't know what happened, but he believes the poisoner is someone with a grudge against dogs in general or the Crufts show in particular- but not Jagger himself. The owners have ruled out any suggestions that another competitor might have poisoned the dog. "We can't and we won't think that this was the act of another exhibitor. If we thought this, we couldn't go on, and the last 30 years would be a complete waste," Dee Milligan Bott said on her Facebook page. "So I ask all of you to unite in finding the perpetrator who did this." However, she suggested in an article in the publication, "Dog World" that it was possible that the target of the attacker might have been another dog she owns, Thendara Pot Noodle. The second dog won best of breed at Crufts, while Jagger finished second in a preliminary competition. Canine competitions have long been hit by claims of unscrupulous behavior - including the owners of rivals slipping dogs drugs. In 1996 a breeder was banned for giving a Chihuahua Valium at another British show. The stakes can be high. Though the prizes for such shows are small - the Best in Show title carries a purse of just 100 pounds ($150) - puppies from winners can fetch thousands. The Botts, who run a dog breeding operation in England, were part owners of Jagger. The dog lived as a family pet with their co-owners in Belgium, where he visited care homes so elderly residents could pat him on the head. "Both families are just devastated," Jeremy Bott said.